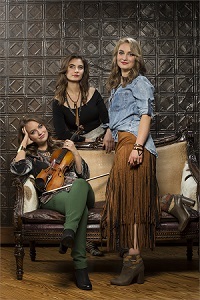 When the Quebe Sisters from Texas take a stage, and the triple-threat fiddle champions start playing and singing in multi-part close harmony, audiences are usually transfixed, then blown away. It’s partly because the trio’s vocal and instrumental performances are authentic all-Americana, all the time, respectful of the artists that inspired them the most. And whether the Quebes (rhymes with “maybe”) are decked out in denims and boots or fashionably dressed to the nines in makeup, skirts and heels, the fresh-faced, clean-cut sisters, all in their 20s, look as good as they sound. Not surprisingly, the Quebe Sisters win standing ovations at just about every show. It’s been that way since 2000, when they started fiddling together as pre-teens. The sisters’ past is as colorful and eventful as their future is bright. Growing up in Burleson, a southern suburb of Fort Worth, Hulda, Sophia and Grace were ages 7, 10 and 12 in 1998 when they attended their first local fiddle competition in nearby Denton, and decided fiddling was what they wanted to do. The girls earned solo and group accolades early on, winning state and national championships in their respective age groups in 1999, 2000, 2001 and 2002. Reserved Seating Tickets: $35 1st Section; $30 2nd Section; $25 3rd Section; $20 4th Section + applicable fees. Lincoln Theatre Members receive $2 off. Tickets go on sale to Lincoln Theatre Members on Friday, November 30 at noon. Tickets go on sale to the general public on Friday, December 7.